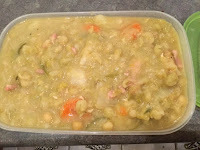 Rae's Nomady: Dutch pea soup - Rae's way. Winter's here, and the temperature is dropping. We've had frost on the cars, and the constant rain and storms is a dead giveaway that we are well into the cold season. 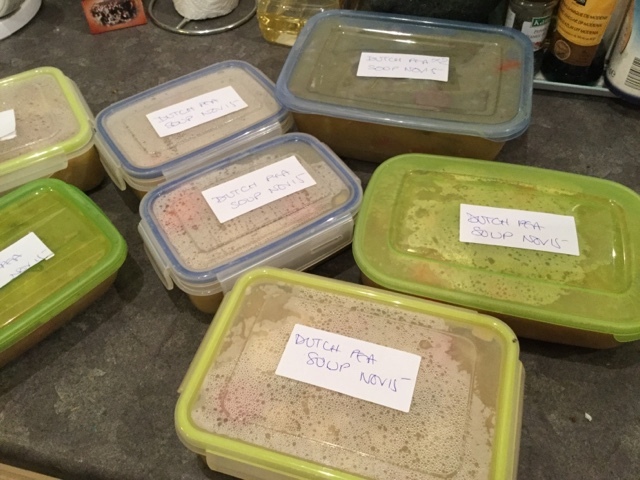 I love the comfort of a large bowl of steaming thick soup and the Dutch have their own national speciality that fits the bill perfectly. It's called 'snert' or 'erwtensoep' and is a thick pea soup that is absolutely perfect for winter weather. It also freezes very easily and is great for microwaving for lunch at the office - something that is incredibly useful for me, since I find I'm usually starving 5 minutes after the usual Dutch cheese sandwich. 500g of dried peas or split peas. The traditional smoked sausage used in the Netherlands is 'Gelderse Rookwust' from the province of Gelderland. It's tied in a loop and is very smooth in texture. If you can't find a good quality smoked sausage you could replace it with frankenfurters or something similar. It makes life so much easier in the kitchen if you do the majority of the preparation before you start cooking - at least enough that you have a sense of 'flow' rather than a start stop feeling. I start with the preparation of the vegetables : all peeled & coarsely chopped in chunks. 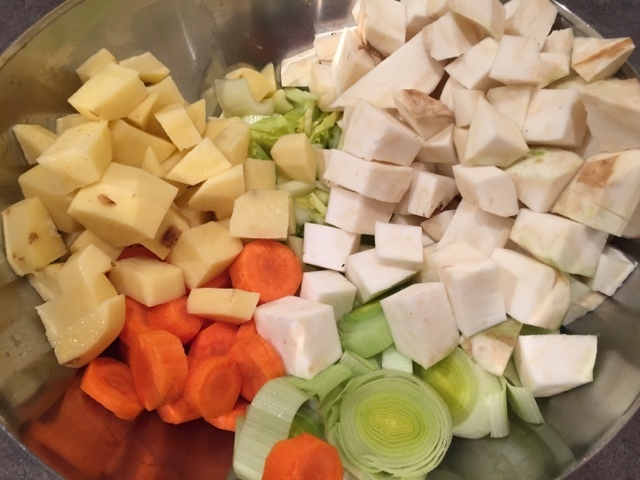 The celeriac is a really important vegetable in this soup - it brings a depth of flavour that would be otherwise lacking Then the meat needs to be diced and the onions chopped into chunks . 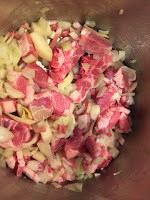 Keep the bone pieces, they add flavour and can be picked out at the end. I soften the onions in olive oil until they start to look a touch translucent, then in goes the chopped pork steaks and the bacon bits. Hold on to the sausage, don't add that just yet. Once you've tumbled the meat once or twice in the hot oil and onion mixture, add the peas,and bring it to the boil for a couple of minutes. 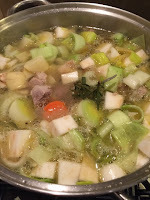 Skim the top, then add the chopped vegetables and water to cover. I add 2 rosemary sprigs at this time to give just that extra little flavour. You can also add a stock cube if you are concerned that the flavour isn't rich enough. Bring it to the boil and turn it down to a beautiful slow simmer for about 1.5 - 2 hours until the vegetable and peas are melting into a beautiful soft mush. Check at half time and season to taste with the salt and pepper. When the soup gets close to mushy and thick, keep a close eye on it - this is the time it's most likely to 'catch' and burn on the base of the pan. Add the sliced smoked sausage in the last half hour and stir in gently. Serve it with fresh bread chunks slathered with butter. 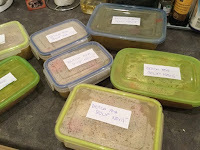 I always make far far too much ( these quantities will serve a large family, and have leftovers) and then I cool it in freezer boxes for taking to work or for a quick easy dinner. Eet smakelijk! as the Dutch would say. Bon Appetit!